EXPOSICIÓN PÚBLICA DEL EXPEDIENTE DE MODIFICACIÓN DE CRÉDITOS Nº 6/2018 CRÉDITO EXTRAORDINARIO. REPARTO DE AYUDAS PARA LA ADQUISICIÓN DE LIBROS DE TEXTO DE ALUMNOS DE EDUCACIÓN OBLIGATORIA (PRIMARIA O SECUNDARIA) MATRICULADOS EN COLEGIOS DE LA CIUDAD DE ÁVILA (CURSO 2017/18). CONVOCATORIA DEL NOMBRAMIENTO DE VECINOS PARA OCUPAR LOS CARGOS DE JUEZ DE PAZ TITULAR Y SUSTITUTO. APROBACIÓN DE LAS BASES Y ANEXOS DE CONVOCATORIA DE LOS PREMIOS A LA MEJOR INICIATIVA TURÍSTICA COLECTIVA. 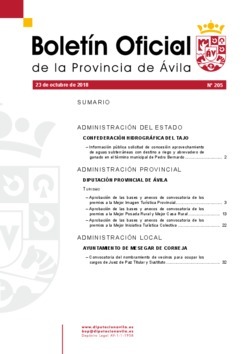 APROBACIÓN DE LAS BASES Y ANEXOS DE CONVOCATORIA DE LOS PREMIOS A LA MEJOR POSADA RURAL Y MEJOR CASA RURAL. APROBACIÓN DE LAS BASES Y ANEXOS DE CONVOCATORIA DE LOS PREMIOS A LA MEJOR IMAGEN TURÍSTICA PROVINCIAL.